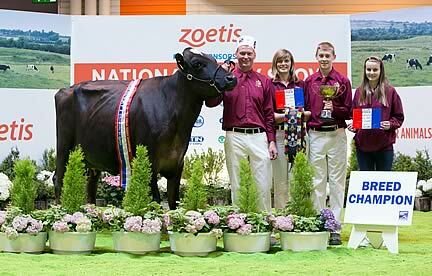 Loukat Lucky, an in milk Ayrshire was awarded the supreme title at the National Dairy Show at Livestock Event at The NEC, Birmingham on Wednesday 3 July. Lucky secured a maximum 50 points from the Livestock Event judging panel in the interbreed championship and the following day was among the winning Ayrshire team to secure the Bledisloe Trophy for the best group. Classified Ex93, Loukat Lucky was exhibited by Richard Bown, Worcester, Worcestershire, who purchased her in 2009 to join his Richaven herd of 70 Holstein and five Ayrshire milking cows. She calved her third 12 months ago, and after yielding 12,909 litres at 4.79% butterfat and 3.29% protein, she is still producing 38 litres a day. She has also just hit a lifetime yield of 40,000 litres. 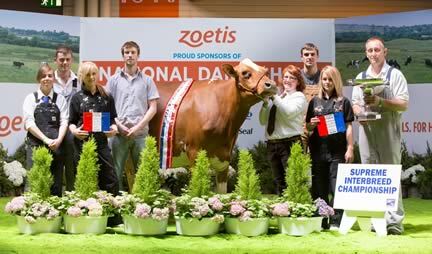 Lucky was no stranger to the ring having won the AgriScot Ayrshire championship in 2011 and 2012 and was nominated Ayrshire representative for the World Dairy Expo for the last two years. As well as Lucky, the Richaven show team included a further eight entries each making their show ring debut and they headed five out of six classes entered. Richard Bown’s homebred Richaven Goldwyn Della EX was awarded the reserve Holstein championship, the third homebred cow to take the title in successive years, while an honourable mention was made to his Carkin F C Michelle. The Richaven herd also took reserve honours with Richaven Adventure Stocking Red in the Holstein heifer championship class. Standing in overall reserve supreme position with 43 points was the Brown Swiss champion Soulseat Jublend Beatrice, classified VG89 and bred by Robert and Sheila McColm, Stranraer, Wigtownshire. She was also awarded the supreme interbreed best exhibitor bred title. A member of their 120 strong herd, Beatrice was in her second lactation, having recorded 7,000 litres at 4.26% butterfat and 3.47% protein as a heifer. A January-calver yielding 38 litres a day, she is the first Brown Swiss to take an interbreed award at the event, a fitting title in what is the breed society’s 40th anniversary year. Last week marked her second show ring outing, following success at the UK Dairy Expo in March where she took the breed championship. Beatrice formed part of a show team of five from the Soulseat herd, which also won the junior breed championship with Soulseat Pitagora Molly. Reserve in the exhibitor bred championship went to Bluegrass Remakes Blackest Blonde, a 2010 born in milk heifer bred by Messrs B A Daw, Herford Heath, Hertfordshire.